Ah, the golden age of baby carriers! From the time your baby has good head control (somewhere between 4 and 6 months) up to about a year or so, you can use pretty much every baby carrier and sling on the market – woohoo! 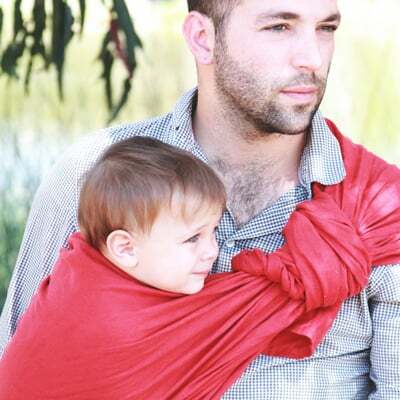 If you are just starting out with babywearing, the only baby carrier we don’t recommend starting with at this age is a stretchy baby wrap. If you already have a stretchy wrap (like the Moby Wrap or the Wrapsody Stretch baby wrap), it may serve you perfectly well during this time. Enough of our customers find that these wraps stretch out too much as babies get heavy, though, that we have decided not to recommend buying these carriers for older babies and toddlers. Many of these are the same carriers we recommend for newborns (the Beco Gemini, the Pikkolo, pouches, ring slings, mei tais and wraps), your child is now appropriate for additional baby carriers that require good head control, including some of our favorite buckle carriers: the Beco Soleil, the Tula and the Ergobaby carriers. Although all of these carriers can be used with an infant insert for younger babies, they truly shine once your baby can use them without the insert. In addition, your baby is now old enough (assuming average development) to be worn on your hip or back, which you will find truly frees up your hands! You can see all the slings & carriers we recommend for baby 6-18 months of age in the categories below. Do it all carrier by Beco - use from infant to toddler, with forward facing option and cooling features for summer wearing.